Chris Wilder wants his Cobblers players to maintain their record of quickly bouncing back after suffering defeats in Sky Bet League Two this season. Town travel to struggling York City on Boxing Day (ko 3pm) still smarting from their 2-1 loss to Portsmouth last weekend, which was only their second league defeat since early September. Their two league defeats prior to going down to Pompey at the weekend saw the Cobblers string together good unbeaten runs, and Wilder wants more of the same. When the Cobblers lost to Dagenhan on September 5, they were unbeaten in their next six league games until they lost 2-1 at Cambridge United on October 17, and the response to that was even more impressive. 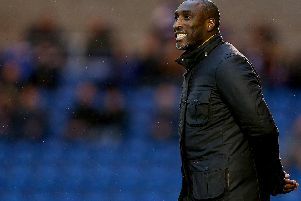 That defeat sparked a 10-match unbeaten run in all competitions, with nine of them victories, and Wilder is expecting his squad to be chomping at the bit on Saturday. “What we have done well this season is that once we have had a defeat we have bounced back pretty quickly, and we need to do that because we want to preserve our position in and around the top of the league,” said the Cobblers boss. The atmosphere at Bootham Crescent is not likely to be as intense as recent matches have been for the Cobblers, who were 4-3 winners in front of 9,000 supporters at Luton prior to suffering that Pompey defeat in front of almost 6,000 fans at Sixfields. The attendance at York is more likely to be around the 3,000 mark, but Wilder doesn’t anticipate any problems with motivation in his team. “I always think Boxing Day games take care of themselves,” said Wilder. “It’s the part of the year where games come thick and fast, and players want to be involved in games on Boxing Day. “It is always a good atmosphere at York, and although they’ve not had a great run they have shown tremendous spirit in their last two games. Wilder is anticipating a tough afternoon in Yorkshire, and says the Cobblers can’t afford to underestimate the edge that a team can get in matches when their very existence as a Football League club is under threat. “York will take great heart in getting a win last weekend, and we know more than anybody about the fight for survival, and how staying in the Football League is massive,” said the Cobblers boss. “Livelihoods, and clubs’ futures and players’ futures are at stake, so there is something for both teams to fight for.